This collection consists of materials regarding Mullah Mohammad Omar, the founder and spiritual leader of the Taliban, and Osama bin Laden. Under Omar’s direction, the Taliban provided sanctuary to al-Qaeda and its leader Osama bin Laden despite demands by the United Nations Security Council that he be handed over for trial for his involvement in the 1998 U.S. Embassy bombings in Nairobi, Kenya and Dar es Salaam, Tanzania. 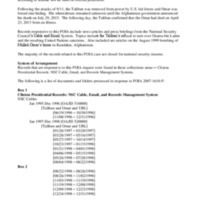 The collection includes news articles and press briefings regarding the Taliban’s refusal to turn over bin Laden and the resulting United Nations sanctions.